Pat the chicken breasts with kitchen towels until dry. This is to ensure that the seasoning and spices adhere to the chicken. 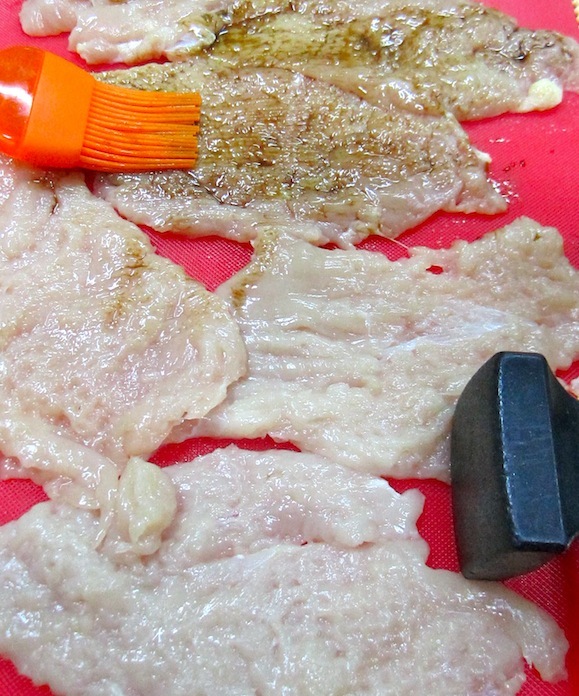 Using a meat tenderizer, pound the chicken breasts until 1/4 in thick. Be careful not to pound too hard so it doesn’t break up into pieces or have “chicken holes” on them. 😳 Season both sides of chicken breasts with salt and pepper and brush a thin layer of worcestershire sauce on each side. Set aside. 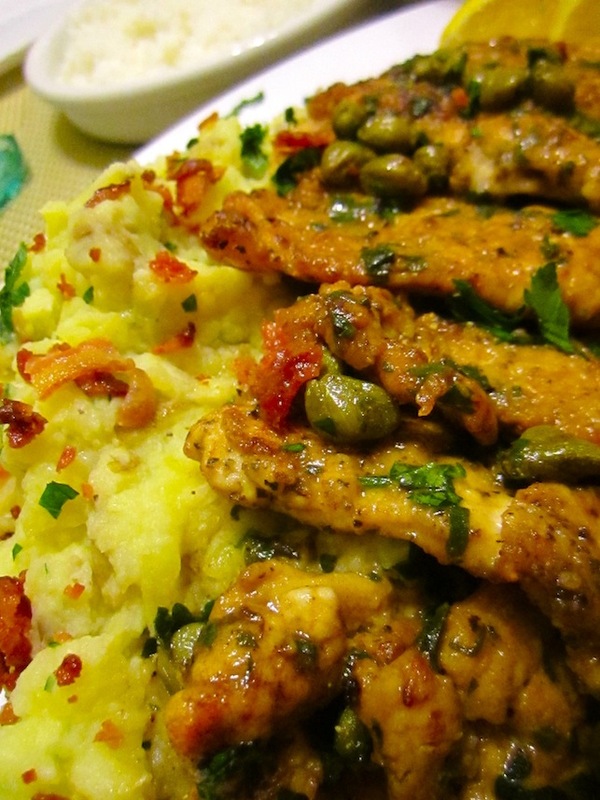 Dredge the marinated chicken breasts in all purpose flour, and repeat until all the chicken pieces are lightly coated. 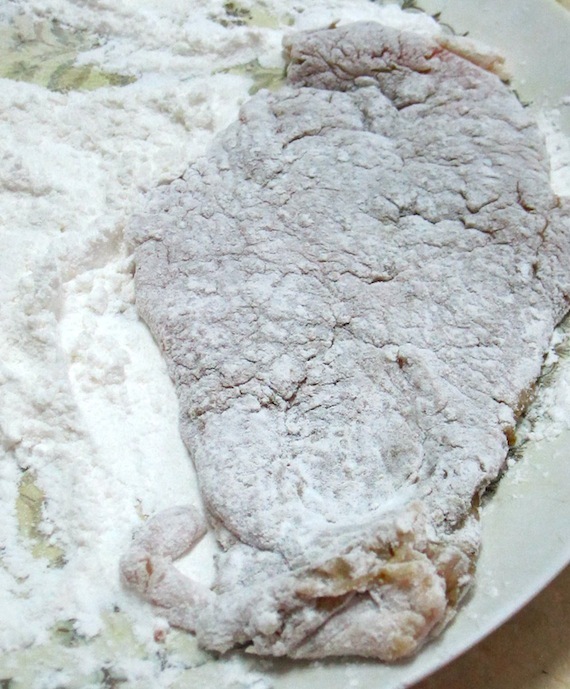 (pat the chicken so that the excess flour is removed). Set aside. 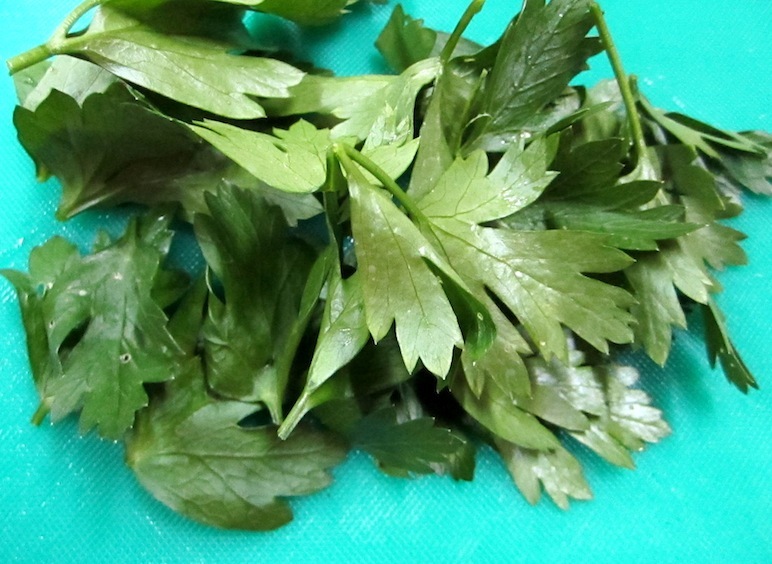 Wash and dry parsley very well. 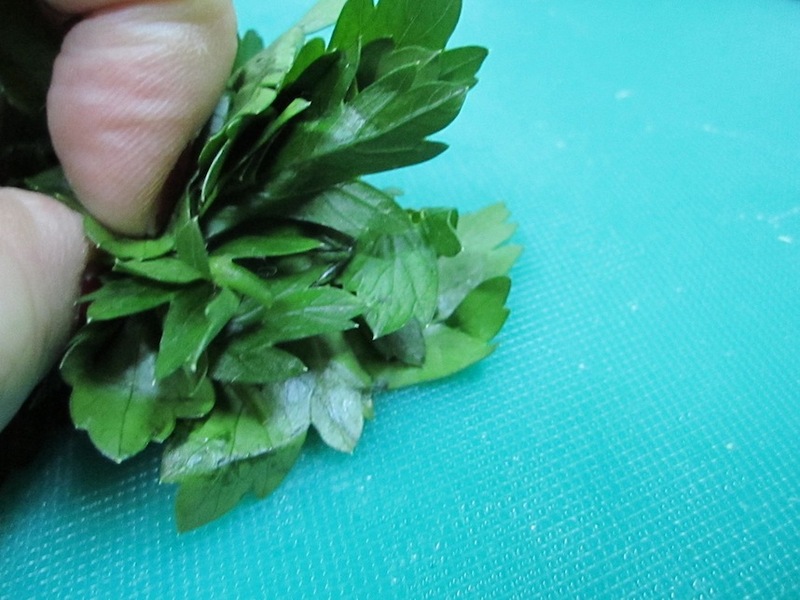 Bunch leaves together and finely chop. Set aside. 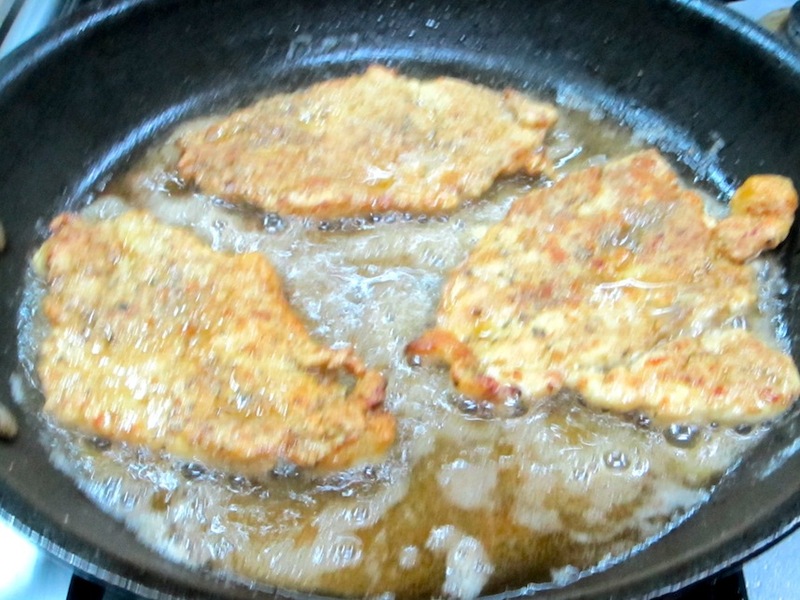 In a non stick skillet, add canola oil and heat over medium high heat. 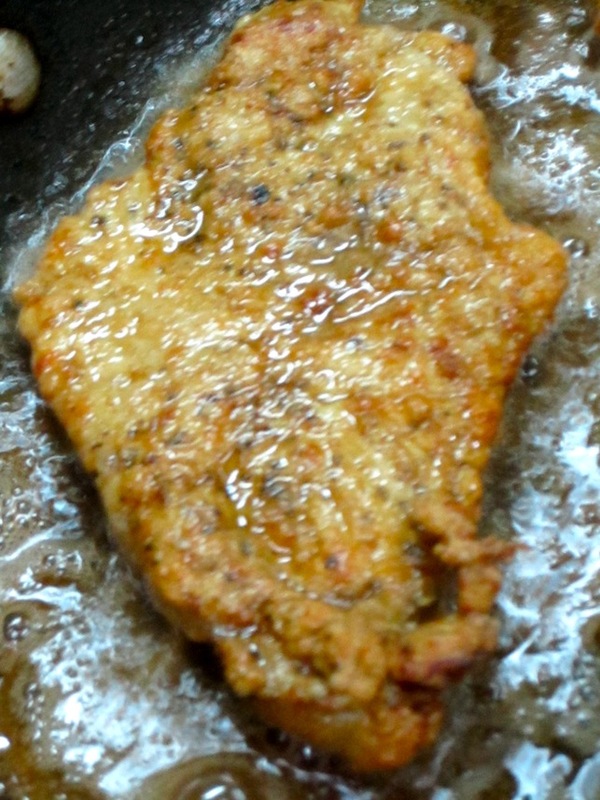 Pan fry the chicken breasts until golden. 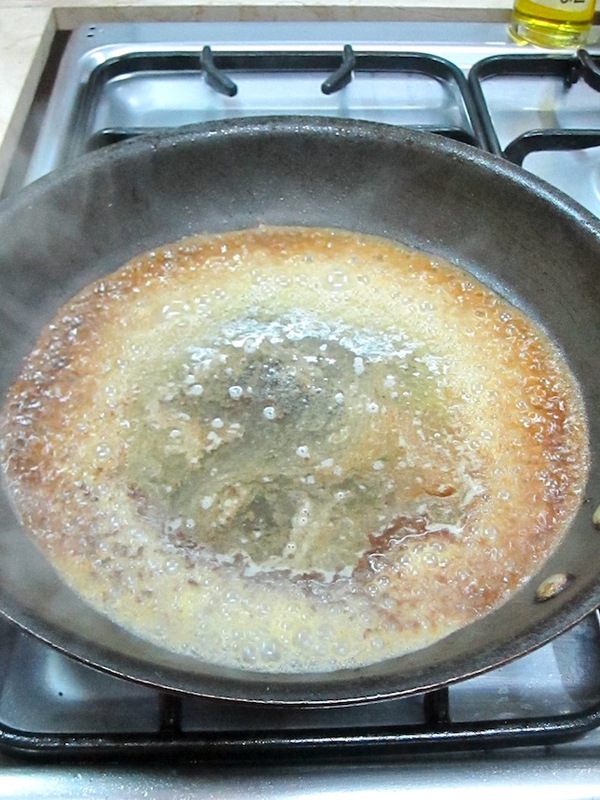 If the oil begins to “dry up” add more oil. 😉 Arrange chicken on a plate and place them in the oven to keep it warm. 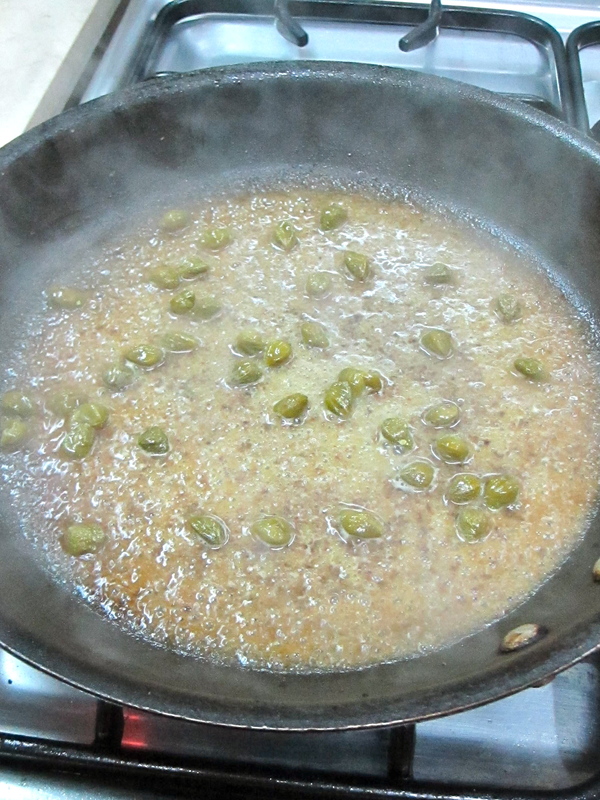 Remove excess oil from the pan except for about 1-2 tablespoons and deglaze the pan with white wine. Please make sure that the wine you use is of good quality, (doesn’t mean that it has to be expensive, just something that you enjoy drinking) because as you cook it down, the alcohol will evaporate and you will be left with the taste of the grape. 😉 Here’s the most important part of this step…. 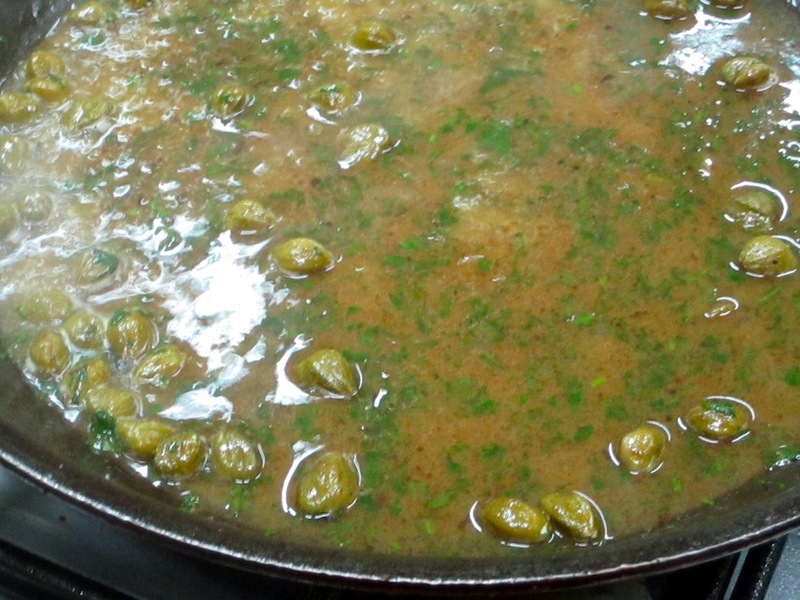 scrape all the caramelized drippings in your pan and allow sauce to simmer and reduce. 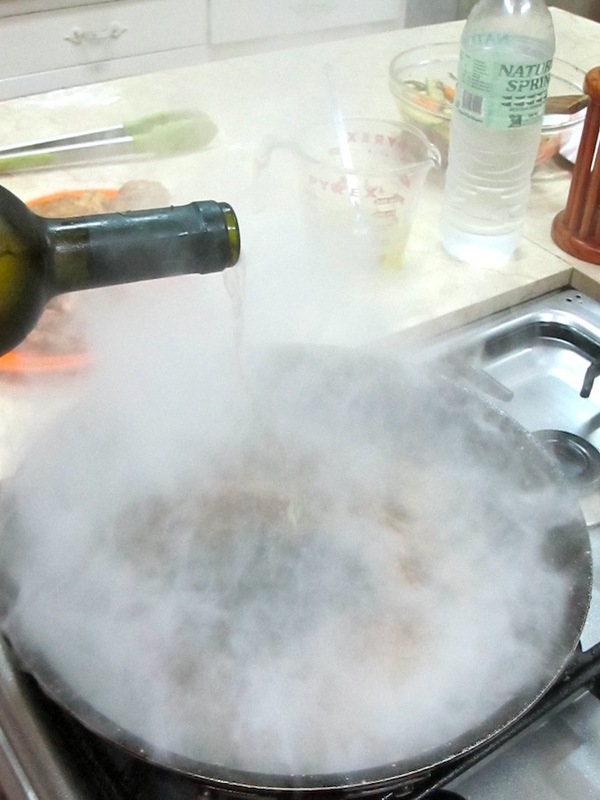 Reduce until 60% of the wine has evaporated. Hi Dash! Please do and let me know how it turns out 😀 Hope you enjoy it. 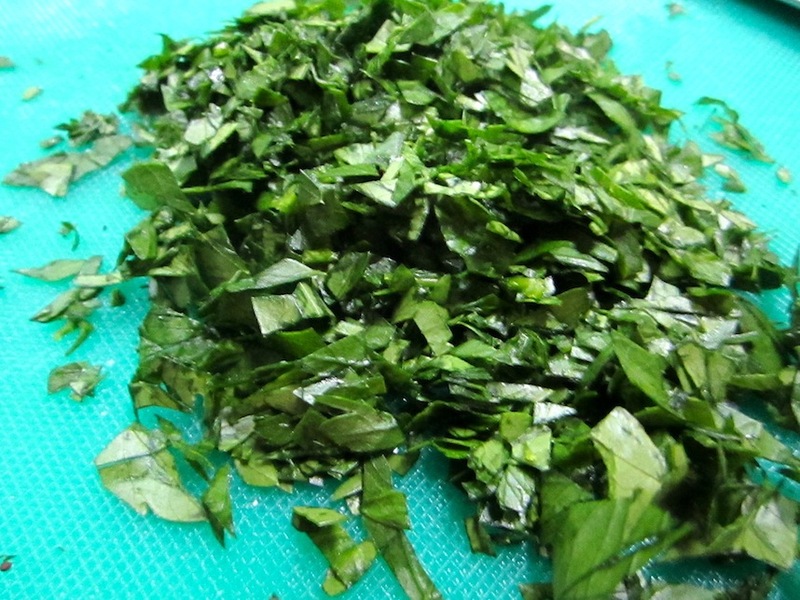 I will try this here in Sarangani… if i get it right, then I will invite friends over! Sounds like a great plan! Let me know how it turns out =D wish i could be there too. i will let my sister try and cook this. Yes! Yes! 😉 Many more to come 😀 Let me know how it turns out. Thanks Pri for sharing this! I love it! Me and my eldest son love to cook, we’ll try to cook this and share to our Bible Study Group. Sounds great, Grace! Please post photos and let me know how it came out! I”m sure it’ll be fantastic! That is awesome news Dey! I am so happy that you all enjoyed the dish! 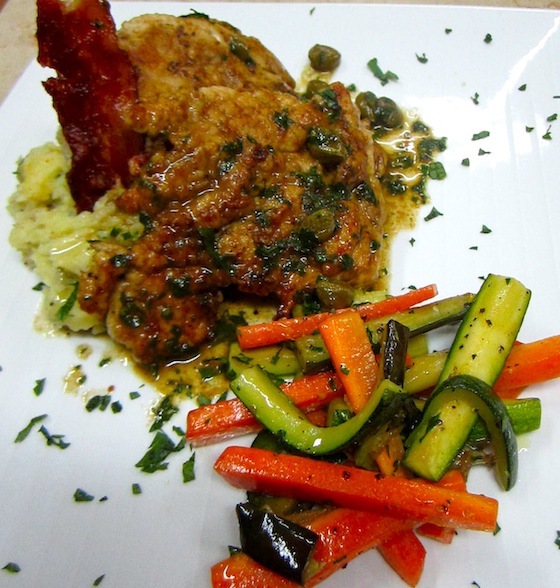 Have other great and easy dishes coming up. 😀 thanks again. 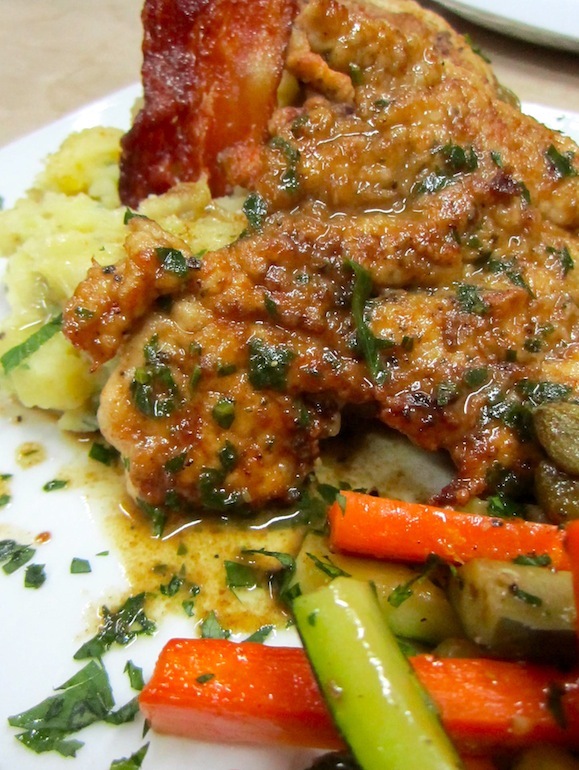 Yes, chicken thighs are indeed more juicy. I finally tried this recipe at home… My husband is giving me a lot of compliment and feels very loved by this recipe! Its a must try!